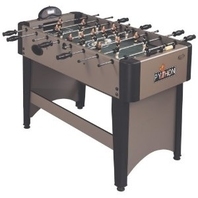 The AMF Varsity is a commercial grade table that comes equipped with a thick cabinet, durable steel corners and solid steel rods. 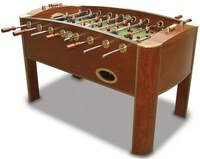 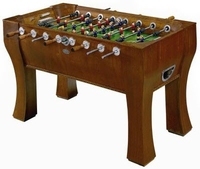 The AMF Varsity table plays more like a vintage foosball table from the 1960's rather than the more modern and fast style of the new Tornado tables. 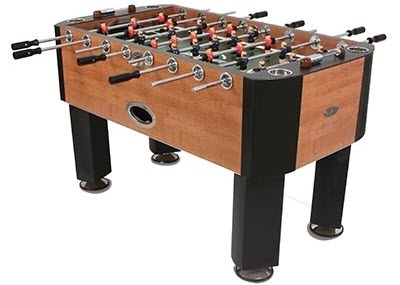 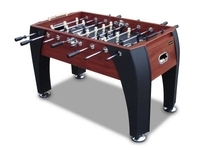 The AMF Varsity table has some high-end foosball table features, but it lacks ball control with the traditional style foosball men that have a rounded toe. 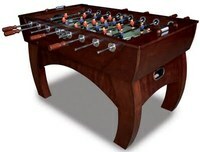 It also has solid steel rods that are slow and sluggish compared to the lighter, hollow rods on the Tornado tables. 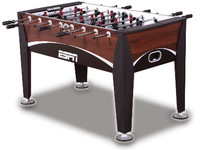 However, we do like a few convenience features like the inset cup holders, side ball return, and adjustable leg levelers on this table.